Some people at NASA think we’ll discover alien life by 2025. What will life on Earth be like then? 1. WE’LL FINALLY DISCOVER WHO THE MONA LISA WAS. 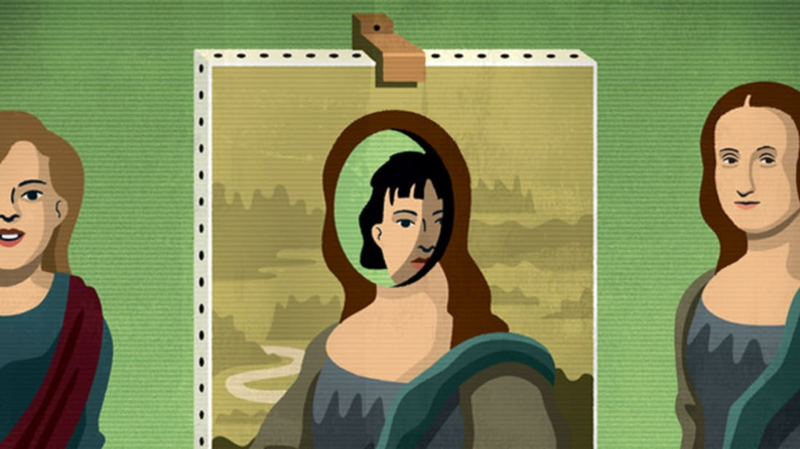 The identity of Mona Lisa has long been a mystery. Some think Leonardo da Vinci modeled his masterpiece on his mother; others, on a secret male lover. In fact, one art historian identified her just a few decades after the painting was completed as Lisa Gherardini del Giocondo, the wife of a wealthy cloth merchant who commissioned the piece to a then-broke da Vinci. (The fact that the artist named his work La Gioconda was a big clue.) Now, thanks to radiocarbon dating, this hunch may finally be confirmed. Researchers believe they may have found Gherardini’s remains in a convent in Florence. If the carbon-14 tests confirm that it’s her, scientists will also do DNA tests to determine the color of her eyes, skin, and hair. With that information, they’ll be able to confirm if she is the world’s most famous half-smiler. 2. GROCERY STORE CHECKOUT LINES? ANCIENT HISTORY. The question “Paper or plastic?” will be a distant memory in the not-so-distant future. The Food Marketing Institute predicts that by 2025, customers will no longer wait in lines to check out at grocery stores. Just like a car zipping through an electronic tollbooth, shoppers will walk out the door and a “frictionless checkout” will automatically account for products in their carts. Also coming soon: stores with moving walls. With a flick of a switch, businesses will be able to change their floor plans and turn into restaurants in the evenings or farmers’ markets on Saturday mornings. 3. THE STRONGEST ROBOTS WILL BE MADE FROM...ONIONS. Here’s the thing about today’s robots: They’re wimps. Even the most powerful can lift only half their weight. Worse, they’re inflexible and their movements are herky-jerky. But that wouldn’t be the case if we could outfit them with lightweight, smooth-moving, and super-strong artificial muscles. In fact, a machine equipped with robo-biceps could lift 80 times its own weight! The problem is, artificial muscles are expensive. For years, scientists have been trying to make them with costly polymers. But in May 2015, researchers at the National Taiwan University discovered a material so cheap, it literally made them tear up: onions. When they coated onion cells with gold and zapped them with electricity, the cells, like human muscles, bent and contracted. Is it too soon to imagine this sort of technology someday powering robots that will carry us piggyback to work while reading us the news and serving us milkshakes? 4. THE INTERNET MAY HAVE MET ITS DOOM. In 2012, archaeologists dug up the remains of King Richard III. Laser scans and analysis taught scientists and historians more about the 15th-century ruler than they ever imagined, revealing how he died as well as clues about his lifestyle and diet (he enjoyed peacock and swan). Academics like Francis Thackeray of the University of the Witwatersrand in Johannesburg are hoping to perform the same techniques on Shakespeare’s bones. An analysis could unearth secrets about the Bard’s own death, diet, and health—and whether he smoked weed. In 2001, fragments of clay pipes containing traces of cannabis were discovered in Shakespeare’s garden. (Hemp was used for rope and clothing in the Elizabethan era, so it follows that some of the plant was used for medicine and pleasure.) Of course, researchers may have trouble digging him up. Shakespeare’s epitaph reads: "Bleste be the man that spares thes stones, and curst be he that moves my bones." 6. ...AND POT COULD BECOME A LEGAL, LUCRATIVE CAREER. By 2020, legal marijuana could be a $35 billion industry in the U.S. A study by ArcView Market Research suggests that as many as 18 states could legalize recreational pot use, while nearly twice that may legalize it for medical use. And that means jobs! The current medical and leisure industry—worth about $3 billion—employs between 46,000 and 60,000 people. That number is only going to get, well, higher. From horticulturalists to procurement officers to dispensary owners, the number of positions that could grow out of a prospering pot industry could make marijuana one of the hottest job prospects for college grads (at least the ones who can muster the will to get off their beanbag chairs). 7. WE’LL BE FLYING ON FUNGUS. Those leaves you rake every fall may fuel your vacation. Researchers at Washington State University have discovered that under certain conditions, a black fungus named Aspergillus carbonarius ITEM 5010—which thrives in decaying leaves, soil, and fruit—can be used to create hydrocarbons that could help make jet fuel, which is a blend of petroleum products. (Intriguingly, the fungus creates the most hydrocarbons when it munches on oatmeal.) Not only would this be cost-effective, it would also eliminate the need for complex chemical processes used to make fuels, since the fungus does the work itself. Researchers hope Aspergillus carbonarius will start to fuel flights within the next five years. 8. WE WILL HAVE SURVIVED YET ANOTHER CICADA PLAGUE. Since biblical times, we’ve been periodically visited by swarms of winged creatures emerging like zombies from the ground. In modern America, the most loathsome of these is a gang of cicadas known as Brood X. Its members are living underground right now sucking on tasty tree roots, but in 2021, after 17 years underfoot, the critters will claw out of the dirt to breed. Brood X will be so big that, in the Northeast, there could be 1.5 million cicadas for every acre—and they will be singing love songs for weeks. The invasion won’t be a threat to crops, but stock up on earplugs: A treeful of buzzing cicadas can top 100 decibels. 9. ART’S MOST TRAGICOMIC MEME WILL BE ERASED. In 2012, 81-year-old Cecilia Gimenez tried to restore Ecce Homo, a 19th-century fresco in her church in Borja, Spain. The result was less than seamless. “Beast Jesus,” as it’s now called, looked more like “a crayon sketch of a very hairy monkey in an ill-fitting tunic” than Jesus wearing a crown of thorns, said the BBC’s Christian Fraser. But the mistake was a blessing in disguise, bringing in more than 150,000 tourists, who each paid a euro to view the Beast. Art historians want to restore it, and one conservator says solvents could remove the paint job in minutes, but the church may let the tourist dollars continue to roll in. Nevertheless, once the meme becomes a thing of the past (perhaps when the Internet collapses? ), Ecce Homo will live again. 10. DARK MATTER WILL BE EXPOSED. Being an astrophysicist is a bit of a grind: Folks studying the cosmos are absorbed by a universe of equations and formulas, but they don’t often get a chance to test them out—the universe is too darn vast. But that’s going to change. By 2024, a powerful radio telescope (basically, a field of dishes and antennas) will help answer the biggest questions plaguing Earth’s biggest brains. The Square Kilometre Array, located in South Africa and Western Australia, will be the world’s fastest, largest radio telescope—and the closest thing we have to a time machine. With it, scientists will peer back billions of years to observe the first black holes, stars, and galaxies. But that’s not all: It will become our greatest tool in the search for alien life, and test Einstein’s general theory of relativity—that is, our understanding of how time and gravity work. We’ll map billions of galaxies extending to the edge of the observable universe. Most exciting, it will help scientists identify dark matter, the enigmatic material composing 85 percent of our universe.